Well our 2015 Wedding Season is officially over. Some days were just a blur and I am still not sure how we survived October. To be honest… I was facing burn out mode. And then comes along sweet Kevin & Casey. They were like the cherry on top this year. Casey is one of those brides that everyone loves. I mean you cannot possibly not love this girl. She was on her A game and had a detailed timeline and list for me. However, that is not why I love Casey, she was more than that. She has become a dear friend. I loved receiving her texts about all the upcoming details. Hearing her excitement and also the obstacles she had to overcome! Her demeanor and attitude no matter what she faces is so positive. She truly is such an example of how to live a joyous and selfless life. I have absolutely loved getting to know this sweet bride. Their wedding day was absolutely GORGEOUS! Casey told me it was because of the prayers of grandmas. And I would have to agree! 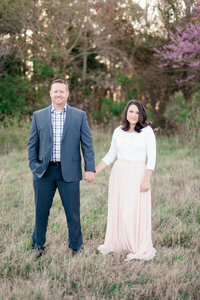 Casey & Kevin’s Visions came to life with the help of friends and family. From the smore bar to the lawn games and warm soft blankets, everything represented Kevin & Casey and their love for one another. Family is everything to Casey so all her details and even the venue itself revolved around that very theme. They married in the middle of the woods surrounded by those who mean the most to them… Including the one and only Murphy the Golden Doodle. He was the Best Dog and he did such an Amazing Job! Watching Casey get ready reminded me why I do what I do. It is for people like her. During the getting ready stage she quietly comforted a sweet baby boy. I later realized that this baby boy was the makeup artist’s son. She had encouraged her to bring her children and that they would be well taken care of while the makeup artist did her work. As I mentioned earlier, family is everything to Casey. She gets it. And with that sweet baby boy in her arms not only did she comfort him, but he also brought comfort to her as she quietly awaited to marry her best friend. Thank-You Mr & Mrs. Nelson for being our cherry on top. We LOVE you guys and hope you are having an Amazing Honeymoon! Thank-You to all the Vendors! You all were incredible to work with!